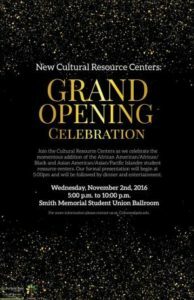 Wednesday, November 2, 5:00 p.m.
Join the PSU Cultural Resource Centers as it celebrates the momentous addition of the Pan-African Commons and Pacific Islander, Asian & Asian American Student Center. Our formal presentation will begin at 5:00 p.m. and will be followed by dinner, entertainment, and dancing. This event is FREE and open to the public. No ticket required. Portland Taiko performs towards the end of the event around 7:00 p.m.